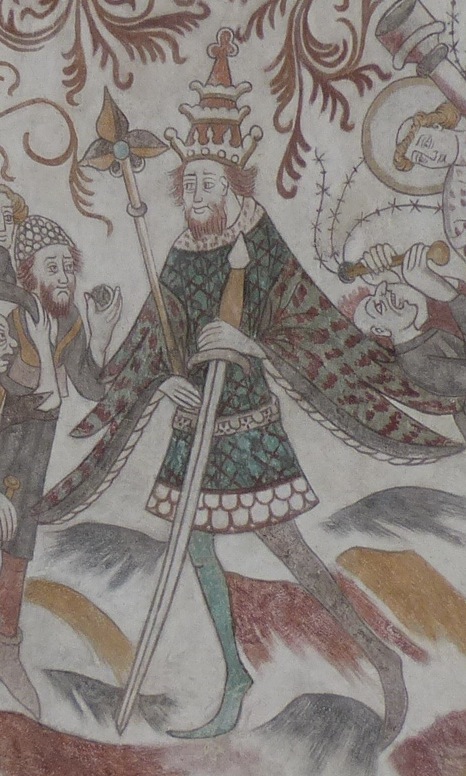 Forum Index > Historical Arms Talk > Sword from Alexandria's Arsenal, Davids Samling, Denmark. Yes Niels, you're probably correct and this one has been bugging me for years as the '812 / 822 hand wave' might just seem a little too convenient an explanation. Consulting my chart of Hijra & Western dates, the Muslim year 812 began on 16th May 1409 and ended on 5th May 1410. The problem here is that the named donor in the inscription (Shaykh) was at that time either the Viceroy of Damascus or of Tripoli, and not the Sultan until 6th November 1412, which would have been in 815 AH. He only started using the term 'al-malik al-mu'ayyad' (the divinely supported king) after he became sultan, and this particular name occurs quite clearly in the inscription. I think the 'correction' to 822 was originally asserted by Etienne Combe in his 1937 work on the subject, and this was repeated by Kalus in 1982 and assumed by everyone since. So, something doesn't add up, and ALL of the inscriptions from this particular bequest appear to be dated 812. The numbers are written out in full grammatical - rather than numeric - form (i.e. 'ten' instead of '10'), and are often incomplete and with a total absence of diacritical marks. Therefore, they may be open to further interpretation. It's also possible that the original scribe confused the number 'ashrah (ten) for 'ishrin (twenty). Now, if the engraver had been, say, a Coptic Christian (they were often employed at the time in administrative roles) then this might have been an easily-made mistake for a non-native speaker of Arabic. However, and as you suggest, a mistake like this may have been worthy of punishment, especially as these inscriptions were of a particularly pious nature and would have been taken very seriously. The bottom line is, of course, that we appear to be missing something with the dating of these inscriptions, unless Shaykh actually had delusions of grandeur and started styling himself as Sultan 2-3 years before he finally rose to that position. And this wouldn't then explain why these swords were donated to the Alexandria Arsenal by him, and not the reigning sultan al-nasir Faraj. 1) So if we take the sword inscription seriously (and not as a calendrical error), then the obvious conclusion is that Shaykh must have used these titles, before he was officially appointed Sultan. Further as you say Shaykh might have been de facto ruler in Alexandria at this point - muslim year 812 - and that he already styled himself with these titles before he was officially declared. Not really delusions of grandeur as he later pulled it off and became Sultan, which shows he already had enmassed so much power it was inevitable he would get the official declaration of Sultan. I think that this must be the most likely explanation so far. It would also mean that Cyprus perhaps knew who the real power was in the region and send the swords to him as a diplomatic gift (maybe to Tripoli if it was there he was still officially viceroy and Tripoli in Lebanon is quite close to Cyprus for it to make political sense (Damascus less so as it is not out to the sea?) -> from Tripoli/Damascus Shaykh then donated the swords to Alexandria - his real power center by now). 2) An alternative hypothesis as that the phrase "al-malik al-mu'ayyad" (the divinely supported king) is not limited to Shaykh, but could have been used by an unknown short lived predecessor and it was a result of a diplomatic gift from Cyprus(?) to Alexandria. Then the lines "abu'l nasr shaykh" maybe his been added later (1412 AD - muslim year 815) when Shaykh was officially declared Sultan? This is off course far more unlikely as we have to "conjure" up a person (a predecessor using the same title, but being in power for a short time and "removed" from history). I think the 'correction' to 822 was originally asserted by Etienne Combe in his 1937 work on the subject, and this was repeated by Kalus in 1982 and assumed by everyone since. So, something doesn't add up, and ALL of the inscriptions from this particular bequest appear to be dated 812. The numbers are written out in full grammatical - rather than numeric - form (i.e. 'ten' instead of '10'), and are often incomplete and with a total absence of diacritical marks. Therefore, they may be open to further interpretation. It's also possible that the original scribe confused the number 'ashrah (ten) for 'ishrin (twenty). Now, if the engraver had been, say, a Coptic Christian (they were often employed at the time in administrative roles) then this might have been an easily-made mistake for a non-native speaker of Arabic. Quite a mystery! I don't know nearly enough Arabic to venture a critical opinion one way or the other, and am just trying to reconcile the sources that I have available (which don't yet include your articles, unfortunately!). Kalus seems to have thought there was some evidence to support the 'correction'... he writes "a reading of 822 is immediately suggested by the presence of two wāw letters", which he says is grammatically incorrect if the second digit is a '10'. Is this an accurate description of the inscription, and do you think it supports the interpretation of the date being simply mis-written? Here are the three Alexandria Arsenal swords from E.A. Christensens collection in 1968. So the middle sword was bought by Davids Samling in Copenhagen in 1998 and the sword on the right was sold at Bonhams in 2012. So unknown whereabouts of the sword on the left. E.A.C. no. 56 (sword on the left) have an inscription of Al Malik Al Ashraf and the date 831 (1427 AD). Some of the islamic inscription goes in over cross-like marks on the blade and is thus unreadable. Blade is 92 cm long and 5 cm wide. E.A.C. no. 57 (sword on the right) have an inscription that is only partly readable, so no date, but the name Al-Saifi Fari. Blade is 92,7 cm long and 4,7 cm wide. Grip in wood covered with leather. In the pommel a copper-inlay on both side in the shape of a byzantine-style-cross. E.A.C. no. 48 (sword in the middle). Blade: 89,2 cm long and 5,3 cm wide with broad fuller half the blade-length. Pommel of brass: 5,2 cm in diameter and 3,1 cm thick. Saif ad al Ukuz al Malaki ai Ashraf mentioned and the year 769 (1367-68 AD). Alexandria Arsenal swords from E.A. Christensen's collection. Source: Ada Bruhn-Hoffmeyer (1968). Gammelt Jern. Vaabenhistoriske Aarbøger XIV. It's great that you got ahold of a copy of Gammelt Jern, Was it hard to find? This is the first photo I have seen of Christensen's second XVII from Alexandria, thanks for sharing! I think I can identify Christensen's fourth Alexandrian sword that Clive mentioned; I suppose it passed through his hands at some point after 1968... It is now held by the Furusiyya Art Foundation, number R-240. It appeared in the exhibit "L'Epée" at the Musée National du Moyen Âge, and the foundation's publication Arts of the Muslim Knight. It appears to be a European XIIIb blade re-hilted in Mamluk style. The inscription is not dated, but refers to an Emir Yilbugha... Kalus suggested this refers to an emir who was in power for a brief period in 1438-39. The foundation counters with an identification of a different Yilbugha from 1361-66, being more consistent with the multiple other XIIIb's bequested in 1367-68. This name appears along with the date 840 (1436-37) on one sword held by the Royal Ontario Museum, not far from where I live. The four Alexandrian swords in this collection are indicated by arrows in this photo; the sword in question is the left-most. The second from the left (with the oblong pommel) bears the same name, but no date. Kalus is correct in that there are a couple of waw letters shown at the end of the inscription. However, the execution of the script is quite simplistic when compared to formal Arabic, so perhaps they may have decided to go for 'ease of engraving' over grammatical correctness. After all, quite a few of these inscriptions are incomplete, lack diacritics, or generally cut corners even though they were made for religious reasons that were usually taken very seriously. As for whether it supports the interpretation of the inscription being mis-written, I'm afraid this is probably going to be seen as a bit of a cop-out, but I'm going to have to give some serious thought to this one! If the date 812 was a mistake, would the engraver have finished an entire batch of engravings in error? It's possible if they were not a native Arabic speaker and were working from a template, perhaps. Or was Shaykh, as Niels suggested, the real power in the region who thought himself 'divinely supported' even before he became sultan? I don't think any other emir in a similar position of power is known to have used the 'al-malik al-mu'ayyad' description at the time. If Shaykh was using this in 812 AH, then perhaps the 'Abu'l Nasr Shaykh' part of the inscriptions - elevated above the main body of the engraved script - had been added later. They are engraved in exactly the same handwriting, though, so perhaps not. What we do know of Shaykh is that before becoming sultan, he spent much of his time in Syria organising rebellions against the sultan, and plotting either with, or against, his longtime rival and co-conspirator Nauruz al-Hafizi. The sultan Faraj rotated the pair of them as Viceroys of Damascus or Tripoli or Aleppo, removing them if one became untrustworthy and installing the other in their place. A strong sultan would have executed the pair of them but this was not the case. I have no idea where the sword on the left is either. I always assumed it was probably in the Nationalmuseet in Copenhagen, but I suspect it may be elsewhere. It's a lovely example of a Type XVII, and was part of the bequest that was made to the Arsenal in 831 AH (1427-28). As such, it is likely that it was either booty from the Mamluk invasion of Cyprus in 1426, or was part of one of the subsequent tribute payments by the Cypriot king, Janus. I think Kalus's assertion that these swords inscribed in the name of Yilbugha / Yalbugha can be dated to 1438-39 is not correct. Typologically (usually they are European Type XIIIb or Syrian-Mamluk types, as here), the swords have much in common with many that feature in the bequests of 1368-69, or thereabouts. The arabic script is also a lot more similar to the earlier bequests than to any of the later ones (from Shaykh's time onwards). Great photos, by the way. Thanks for posting them here! I was fortunate enough to have handled the ones in the Royal Ontario Museum back in 2012. The big Type XIIIa with the multiple fullers was very impressive and it really stands out from the rest. Oakeshott thought it was 'singularly ugly', but I would disagree, having held it and appreciated it fully. So there was some serious power-struggle in the period. So both Shaykh and Nauruz al-Hafizi were really pressing Sultan Faraj and each other for dominance. So I think it is possible that Shaykh in that power-game might have elevated himself (taking a huge risk) above his status; but his followers could have seen this as a sign of strength (and divine wish?)! I totally agree that if Sultan Faraj did indeed have the power he would (and should) have executed them both. I think Sultan Faraj tried to "balance" these two pretenders out between each other, fearing if he only manage to kill one of them the other would attract all his followers and become to powerful for him to handle. As far as I understand Arabic originally didn't use them, but wasn't it invented in the semitic language group by the Jews whom started to use diacritics as spoken Aramaic? and written Hebrew had seriously drifted from each other especially when it came to vowels (Jeshua - Joshua, so that why we know him latinized as Jesus and not Josus)? Same thing happens in Arabic, so as oral changes inevitable sets in, you needed especially for the Quran to preserve right wording especially when non-arabs had to learn the Quran. Idea: So maybe at some point simple non-diacritic use of arabic might be seen as more "pure" then the ones using diacritics?? [As you say the sword inscription is simplistic]. Writing in non-diacritic arabic is also some kind of statement -> pureness & "arabic'ness" and maybe not simplistic as in less refined. Thanks for answering, I don't think it's a cop-out. I can appreciate now the amount of ambiguity in these particular inscriptions; the museums and auction houses gloss over it completely and give the impression that 822/1419 is engraved plain as day. I think Kalus's assertion that these swords inscribed in the name of Yilbugha / Yalbugha can be dated to 1438-39 is not correct. There is some consensus on this then, good to know! I agree, it is very imposing (even from the other side of the glass). I also found the two type XIX's to be very elegant looking. The one I find interesting in particular shares the hilt furniture and overall profile with the "classic" Alexandrian XIIIb's, suggesting the types are contemporary, or even that type XIX evolved directly from XIIIb? Shaykh and Nauruz were played-off against each other by the Sultan Faraj on many occasions. By 1412, both emirs could be described as 'overmighty subjects' as both had instigated various rebellions against the sultan, but neither trusted the other. Faraj evidently thought that he could keep them at arm's length by maintaining this rivalry between them, but this policy backfired with lethal results. In March 1412, the two emirs entered into a shaky alliance and cooked-up another rebellion in Syria. The sultan marched to deal with this, bringing the Caliph al-Musta'in Billah al-'Abbas with him as religious backup, and probably wanted to rid himself of these troublesome emirs once and for all. Faraj's army was defeated and the sultan fled, taking refuge in the Damascus Citadel, while the Caliph was captured. As a final insult to the sultan's effective power, the two emirs then elevated the Caliph to be sultan, and used his influence over the religious judges to have him sentenced to death in absentia. The following June, Faraj was murdered in his retreat in the citadel by assassins, who stabbed and strangled him before throwing his body from a high window onto a rubbish heap, according to Ibn Taghri Birdi's "History of Egypt". Shaykh became Commander-in-Chief of the armies, while Nauruz was made Viceroy of Syria. They removed all untrustworthy emirs and Shaykh, having got all those remaining to swear allegiance to him, then 'persuaded' the Caliph to step down and appoint him as his successor. This was the point - November 1412 / 815 AH - when he was first recorded as using the title 'al-malik al-mu'ayyad'. As for Nauruz, he fared little better than the sultan against the machiavellian Shaykh. When he discovered that Shaykh had effectively usurped his way onto the throne, he tried to get a legal condemnation, and when this failed he rebelled openly. He too took refuge in the Damascus citadel but was tricked into leaving by a cunningly-worded (but technically flawed) legal document. When he presented himself in front of Shaykh, and thinking himself safe, he was seized and executed after being shown the legal flaws in the agreement. This was in April 1414, or 817 AH. Interestingly, at least three European swords were bequeathed to the Arsenal of Alexandria with inscriptions that bear this date, presumably to cement the Lusignan-Mamluk treaty. That's absolutely correct - it's basically one of the 'classic' XIIIb types, with almost exactly the same inscription as those of the 1367-68 bequest but with probably the earliest verifiable Type XIX blade. It's a little broader than the later XIXs, and only a little more slender than its contemporary Type XIIIb swords. Its maker's mark is in the form of the letter 'S', not too unlike those found on the 'classic' XIIIbs but without the accompanying concentric circles. It also handles just like those swords, with a very similar balance and perceived weighting of the centre of percussion. It weighs 1,370g, or 3lbs. The group of Type XIX swords from the 1432 bequest to the arsenal (like the other one in the ROM with the 'teardrop' pommel) are far more slender and very light in the hand. The weights of these examples barely reach 900g, or circa 2lbs. Looking at the earlier sword from the 1367-68 bequest, and given the similarities with the XIIIbs, you could well be right in your idea that the one evolved from the other over time. There are three other XIXs with similar Alexandrian dates (1367-68 & 1368-69) including one at Dean Castle, Kilmarnock (Acc. No. S.86, with a brass pear-shaped pommel) and another two in Istanbul's Military Museum (Acc. Nos. 17385 and 14782, both with octagonal pommels). All of them have the same lone 'S' maker's mark as the ROM sword, and have blades of similar proportions (all within 2cm in length and within 1.5mm in width). Wow, that is some story - worthy of a film! Shaykh certainly tricked and timed his betrayals skillfully. Was the murder of Faraj by the Assassins linked to Shaykh or Nauruz according to the historians (Birdi?) or did the Assassins just see an opportunity to get a Sunni-leader and went for it? As the Mamluks were Sunni and had fought both Christians and Shia-muslims with equal zeal then the Ismailite-Shia Assassins ("seveners") might have been promised something in return (perhaps also tricked by Shaykh); though the prime objective of Assassins surely must have been the reinstating of a Ismailite-Shia-ruler in Egypt as it had been under the Fatamid Caliphate, before Saladin conquered it? Do we know more precisely what the trickery was in that legal document? Otherwise since I have acquired the article by Ada Bruhn Hoffmeyer "To riddersværd i en dansk privatsamling". Vaabenhistoriske Aarbøger VII (1952-1954) I wonder if you know this article, Clive? Bruhn Hoffmeyer lists some Alexandria Arsenal swords in museums and collections outside Istanbul. She notes that Royal Ontario Museum has 4 swords, Metropolitan Museum 1, de Young Memorial Collection 1, Carl Otto von Kienbusch 2, Bashford Dean 2, Baron de Cosson 1 or several (one of these was sold at Sotherby's in 1946). Wonder if these swords are accounted for? (the Harriet Dean sword now is!). 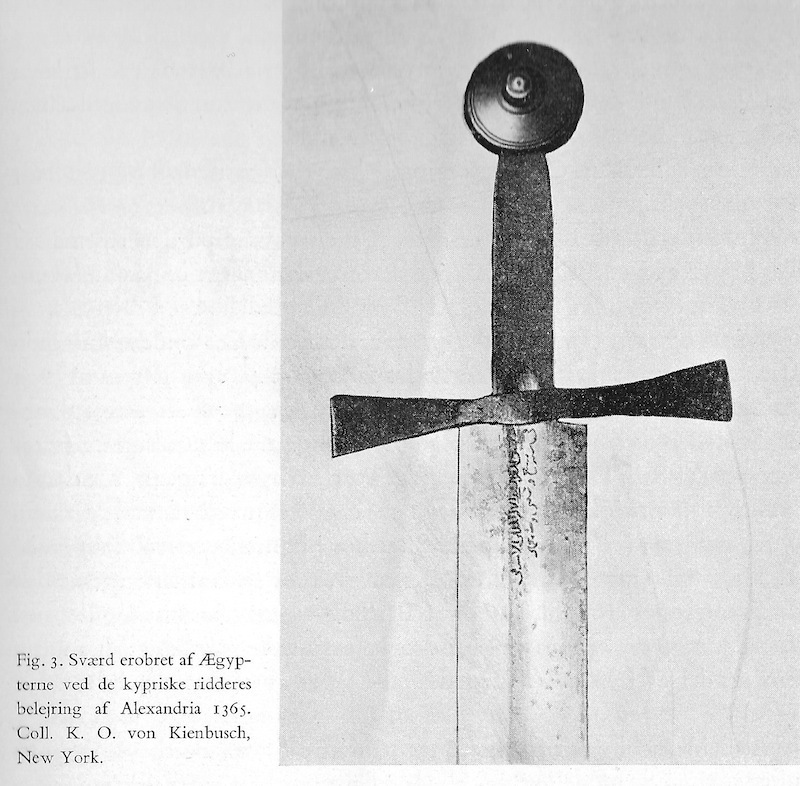 Her article informs that the Alexandria Arsenal sword that E.A. Christensen has (bought in Stockholm and sold again at Bonhams in 2012) had a type-parallel with a sword which in former times were in Berlin's Zeughaus, that originally came from the Hungarian castle Kreuzenstein and could have been owned by Emperor Albrecht II in 1438-39. She has an image of the arabic text on the E.A. Christensen sword and of one of the two swords of von Kienbusch. Furthermore she has an image of two of the Ontario swords, but Mark already provided an image of all four given above. Arabic inscription on the Alexandria Arsenal sword of the E.A. Christensen collection, sold at Bonhams in 2012. Source: Ada Bruhn Hoffmeyer "To riddersværd i en dansk privatsamling". Vaabenhistoriske Aarbøger VII (1952-1954). Alexandria Arsenal Sword from Carl Otto von Kienbusch's collection in New York. Source: Ada Bruhn Hoffmeyer "To riddersværd i en dansk privatsamling". Vaabenhistoriske Aarbøger VII (1952-1954). The murder of Faraj was certainly instigated by Shaykh and Nauruz acting together, and very probably with the Caliph being involved also. Having just read the relevant passages from Taghri Birdi again to refresh my memory, the assassins were not part of any sect such as the Nizari Ismailis (who had little political influence by 1412) but were in fact a small group with close ties to the aforementioned emirs. One was the brother of the Caliph, another was one of Shaykh's mamluks, the third was one of Nauruz's men. There were also two men described as linkmen and a couple of boys, their servants. They all stabbed Faraj with daggers, apparently wounding him in five places and then one of the boys came and strangled him when he was down. Faraj did not die quickly, so they continued strangling him and eventually cut his throat for good measure. When he was finally dead they stole his rich clothes and threw his body on the aforementioned rubbish heap where it remained for nearly two days. Skipping forward to 1414 and the tricky legal document, it seems that Shaykh swore an oath for the safe conduct of Nauruz from the Damascus citadel. Shaykh's confidential secretary dictated the oath (in formal Arabic) to his scribes, but deliberately mispronounced some of the finer points so that their true meaning would become twisted. Nauruz was accompanied by a number of Turkish jurists who read it and failed to spot the trap as they were apparently ignorant of the nuances of legal Arabic. When Nauruz came to negotiate with Shaykh, the Chief Qadi (Islamic judge) asked "Is the Sultan's oath valid?" and as soon as it was determined that it was not, Shaykh ordered the seizure of Nauruz and his jurists. The latter were imprisoned and Nauruz was executed a short while later. His head was displayed on the Zuwaila Gate in Cairo nine days later. 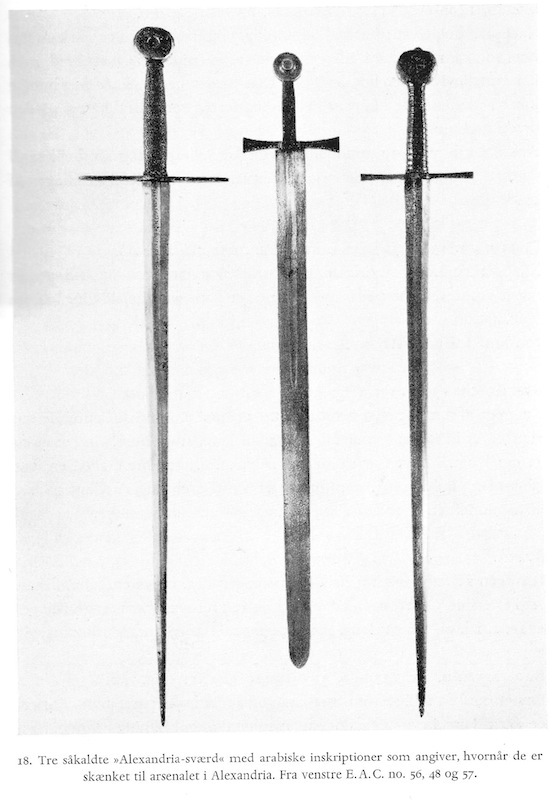 I do have a copy of the Hoffmeyer article, and of the swords she mentions, most can be accounted-for nowadays. The only one that I have not been able to find anything about is the one mentioned in the de Young Memorial Collection. When I contacted this institution (in San Francisco), the curator was unaware of any Alexandrian sword having been in the collection. Sultan Faraj was murdered in a very ignoble way by the conspirators - but how did these men get access to the Sultan so easily? The Sultan's guards must all have been bribed to look the other way, because they were also exiting with his clothes and his body to throw it in the rubbish heap. About the legal matter: Shaykh must already have known that Nauruz didn't have great skills in the arabic language and that he surrounded himself with Turks, so the ploy could have good chances to work. If both Nauruz and Shaykh were Mamluk slave soldiers risen through the ranks it is understandable if neither had any real grasp on Arabic, as they probably were foreign slave boys. Is Nauruz name connected with the Nowruz festival (Now-ruz = New Light; Persian New Year, Spring Equinox), because that hints to him being Persian and not Arab? NB: Found a link that said that "Nawruz" was celebrated in Cairo where the "Emir of Nawruz" either naked or wearing colourful clothes rode a donkey in the streets collecting "debts". It was banned by Sultan Barquq in 1385. Source: Medieval Islamic Civilization: An Encyclopedia, Vol. 1 (2006); Edited by Josef W. Meri, page 560. So Nauruz could have gotten the name as a boy before the festival was outlawed in Egypt. The history of Sheykh, Nauruz, and Faraj is fascinating! There are three other XIXs with similar Alexandrian dates (1367-68 & 1368-69) including one at Dean Castle, Kilmarnock (Acc. No. S.86, with a brass pear-shaped pommel) and another two in Istanbul's Military Museum (Acc. Nos. 17385 and 14782, both with octagonal pommels). All of them have the same lone 'S' maker's mark as the ROM sword, and have blades of similar proportions (all within 2cm in length and within 1.5mm in width). Thats very interesting that there is a clearly distinguished group of these early XIX's. I was familiar with the Dean Castle example from a hilt photo in the museum's online collection, but didn't know enough additional details to link it to the ROM sword. For the other two I only have Kalus' brief descriptions and abbreviated photos. Bruhn Hoffmeyer lists some Alexandria Arsenal swords in museums and collections outside Istanbul. She notes that Royal Ontario Museum has 4 swords, Metropolitan Museum 1, de Young Memorial Collection 1, Carl Otto von Kienbusch 2, Bashford Dean 2, Baron de Cosson 1 or several (one of these was sold at Sotherby's in 1946). Wonder if these swords are accounted for? The XVIIIc in the Met originally belonged to Bashford Dean; Kienbusch seems to have ultimately had four, judging by the Philadelphia museum's online collection (Kalus only identifies three; he seems to have been working from an out-of-date catalogue?). De Cosson originally owned XIX.7 in Records, with the famous finger-guard, now in the Royal Armouries. Is the pommel on the Dean Castle sword an Oakeshott Type W OR a more rounded later variant of Type F ?? Actually some of the swords-depictions from Dråby Kirke (1460-1480] has a pommel, that looks like a mix of Oakeshott Type W and Type F - [angular Type W?] and that is 100 years later than the Dean Castle sword. I haven' seen any surviving Danish sword with it. I have only seen this precise form of pommel on Alexandrian swords. There are at least two examples in the Askeri Muze in Istanbul, and another is featured on the cover of the 2009 Park Lane Arms Fair catalogue (accompanying one of Clive's articles). All seem to be quite similar XIX's or XIIIb's as discussed here. I have only seen this precise form of pommel on Alexandrian swords. There are at least two examples in the Askeri Muze in Istanbul, and another is featured on the cover of the 2012 Park Lane Arms Fair catalogue (accompanying one of Clive's articles). All seem to be quite similar XIX's or XIIIb's as discussed here. You think it is a local Italian pommel style (as many Alexandrian swords seems Italian in origin). The 'handwriting' of the inscription is quite different from the other examples I am familiar with, and the auction house's description of it seems a little confused. They tentatively read it as "This is a waqf of the Emir of Yalbugha, in the year 862", then relate it to the previously discussed Emir Yalbugha who became governor in 1438 and died in 1439 - which corresponds to year 842-43 not 862. Maybe that uncertainty kept the buyers away from this very high price? So is it a fair assumption that the blade was refitted into an Oriental style?